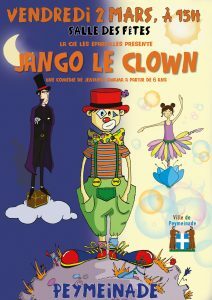 The theatre company “Les Eparpillés presents Jango The Clown. A free theatrical performance for children 6 years and above. Jango, is a clown who, is scared of everything ever since he was a baby clown. He hides away his fears inside a box of mischief. There is a monster named “Crock” who tried to stop Jango from making the children laugh. Jango has a flower called “Lilly” who desperately tries to help Jango be more confident in himself. But the jealous “Crock” captures Lilly and tries to keep her for himself. Will Jango rescue Lilly? Will Lilly be able to stand up to Crock? Written by Jennifer CHIAMA and directed by Fabien BUZENET, its a poetic story full of hope courage mixed in with dance, song and comedy. Come along with your children and enjoy this very special performance of Jango the Clown. 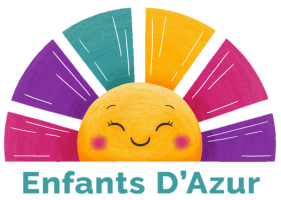 The production takes place on Friday the 2nd of March at 3pm in La salles Des Fêtes, Peymeinade. Duration : 40 minutes long.